Spring can inspire especially after a long winter. One of the first signs of spring in Tennessee are redbuds, and I've always loved them and the vibrance they bring so I wanted to include them in one of my paintings. 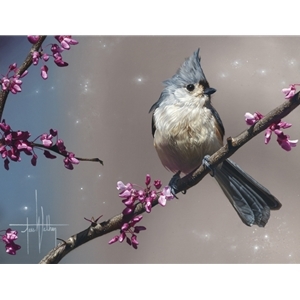 The subdued warm and cool hues of the background paired with subtle tones of a titmouse's feathers seemed like a perfect match and create a harmonious image. I hope this piece inspires you and brings the excitement of spring into your life.